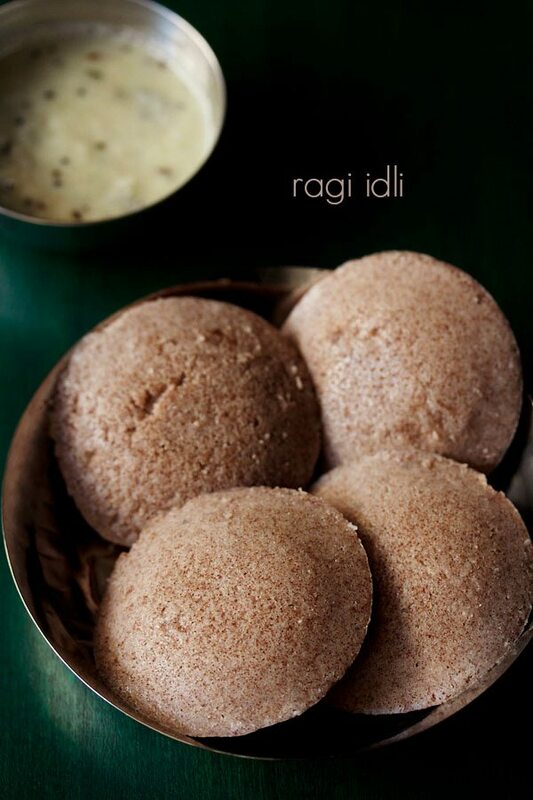 ragi idli recipe - soft as well as nutritious idlis made with finger millet flour, parboiled rice & urad dal. ragi idli recipe with step by step photos – nutritious and delicious idli made with finger millet flour (nachni or ragi flour), idli rice and urad dal. 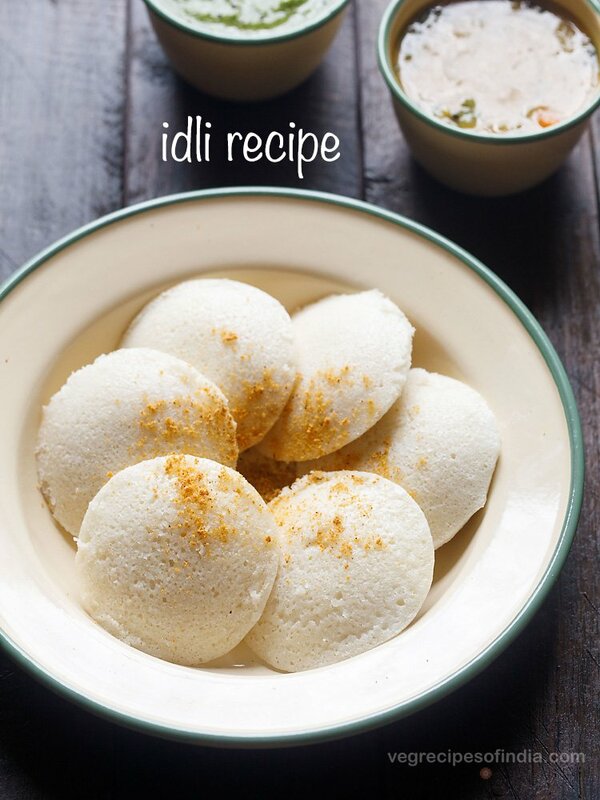 sharing one more variety of idli recipe. idli is our favorite breakfast and so i make these soft and fluffy steamed rice-lentil cakes usually on weekends. this recipe has a millet added in it and it is finger millet or ragi or nachni. i even add finger millet flour to our everyday rotis or chapatis too, just to boost the content of protein, calcium, fibre and other nutrients. with breads, cookies and cake, i have disasters with ragi flour. so i have stopped trying baking anything with ragi flour. 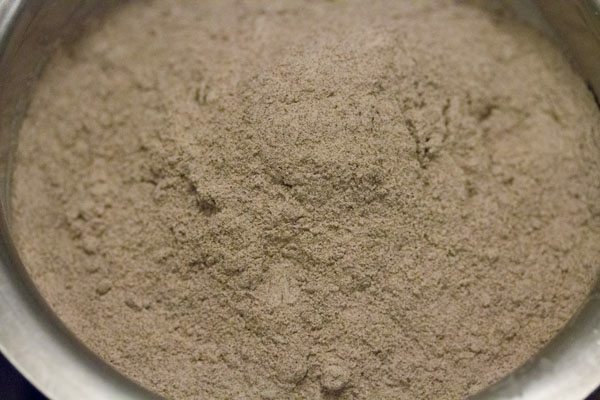 more health benefits of ragi here. i make both ragi idli and ragi dosa with this method. i have already shared the recipe of ragi dosa (fermented version) and instant nachni dosa. if you want, you can also prepare ragi idlis the first day and make ragi dosas the next day. 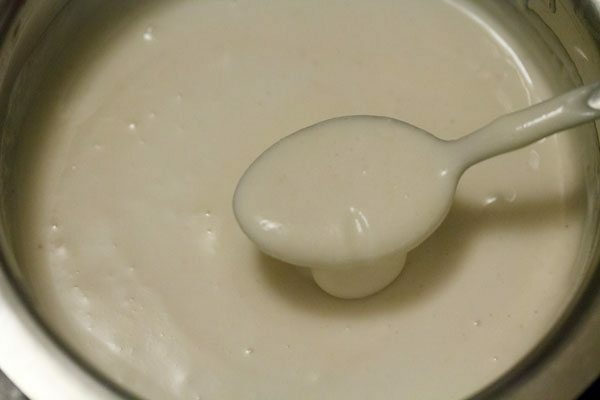 the batter can be easily refrigerated for a couple of days. the proportion of the rice, urad dal and ragi flour in this recipe, gives soft ragi idlis as well as crisp dosas. serve ragi idli with coconut chutney and veg sambar. 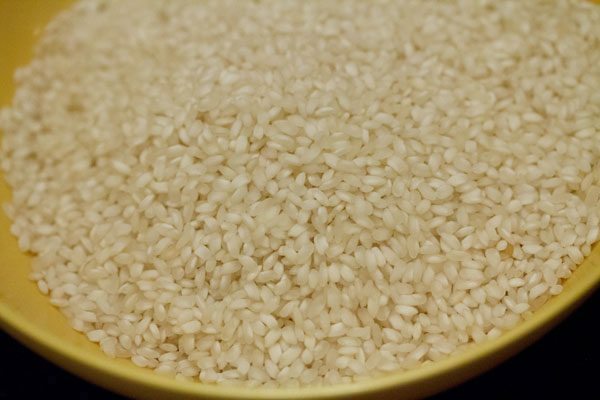 in a bowl, rinse the rice a couple of times. then add 1 to 1.5 cups water and keep aside. 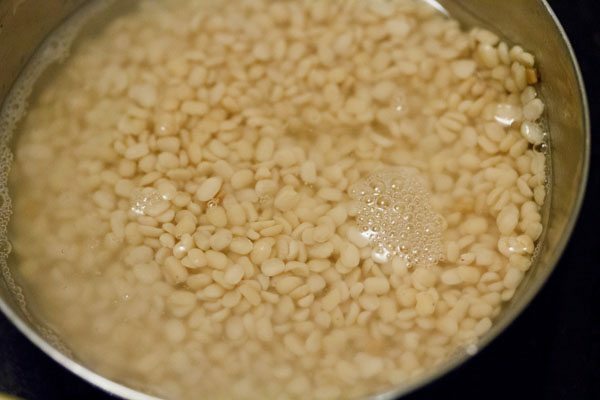 rinse ¼ cup thick poha once or twice and add to the rice. mix well. cover and keep aside for 4 to 5 hours. in another bowl take urad dal and fenugreek seeds.rinse for a couple of times and soak both the urad dal with the fenugreek seeds in 1 cup water for 4 to 5 hours. after 4 to 5 hours, drain the urad dal and add in a grinder jar. grind the urad dal and methi seeds till you get a smooth and fluffy batter. add water in parts while grinding. 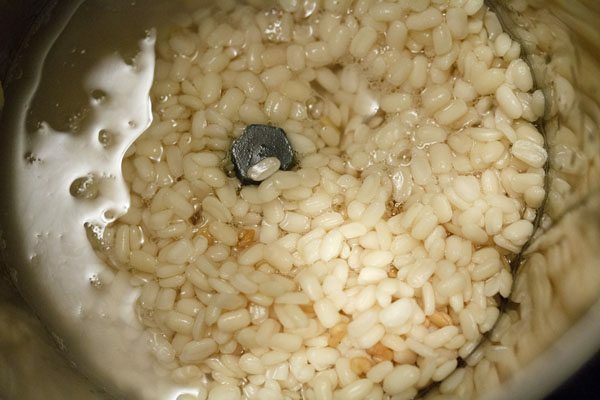 i used overall ½ cup water for grinding the urad dal. take the urad dal batter in a bowl or pan. next drain the rice & poha and add them to the same grinder jar. depending on your jar capacity, you can grind the rice in two to three batches. for the first round i used ½ cup water and for the next round i added ¼ cup water. 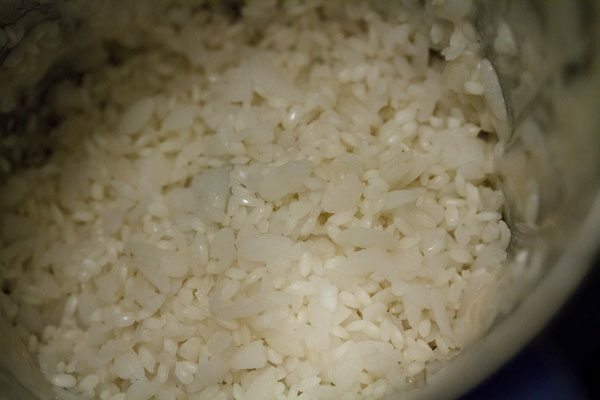 so overall i used ¾ cup water for grinding rice. 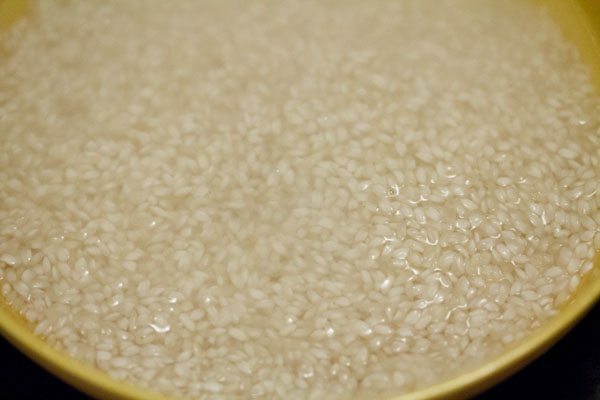 grind the rice till smooth or a fine granular consistency in the batter is also fine. pour the rice batter in the same bowl having the urad dal batter. mix both the batters very well. 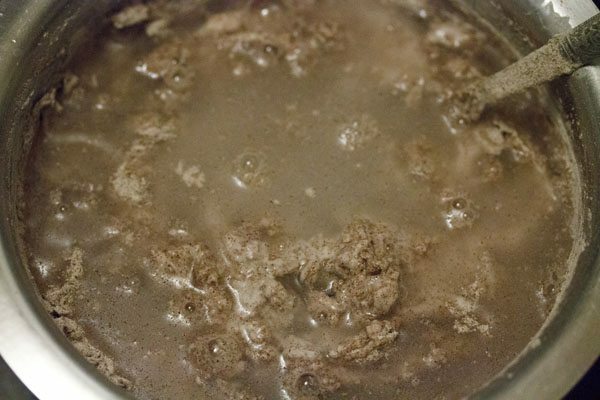 now add 1 cup ragi flour and ½ cup water. you can adjust the water amount here depending on the consistency of the batter. mix very well with a spoon or with your hands. break the lumps if any. mix to a smooth batter. a bit of handwork is required while mixing the ragi flour with the idli batter. cover the bowl or pan with a lid and let it ferment overnight or for 8 to 9 hours or more depending on the temperature conditions in your city. the batter will increase in volume and double up. 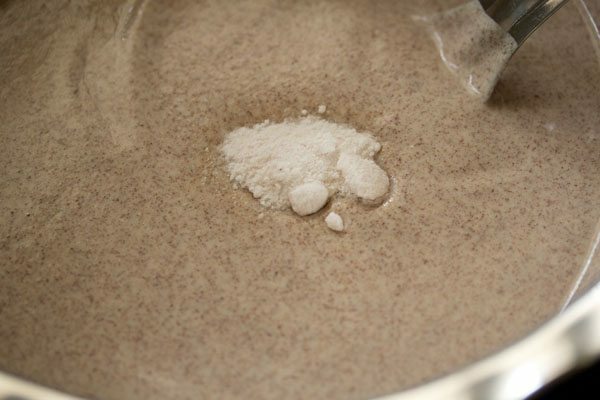 if the batter does not increase in volume, then just add ¼ tsp baking soda in the batter. mix very well and then proceed to steaming the ragi idlis. add salt and mix very well. i added salt the next day due to it being a cold season here. in a warmer climate, add salt before you keep the batter for fermentation. grease the idli moulds with oil. pour the batter in the idli moulds. before placing the idli stand, add 2 to 2.5 cups water in an electric cooker or steamer or pressure cooker. bring this water to a boil. then place the idli stand in the hot water. for an electric cooker and steamer cover with its lid and steam. for pressure cooker, remove the vent weight/whistle from the cooker and secure the lid tightly on the cooker. 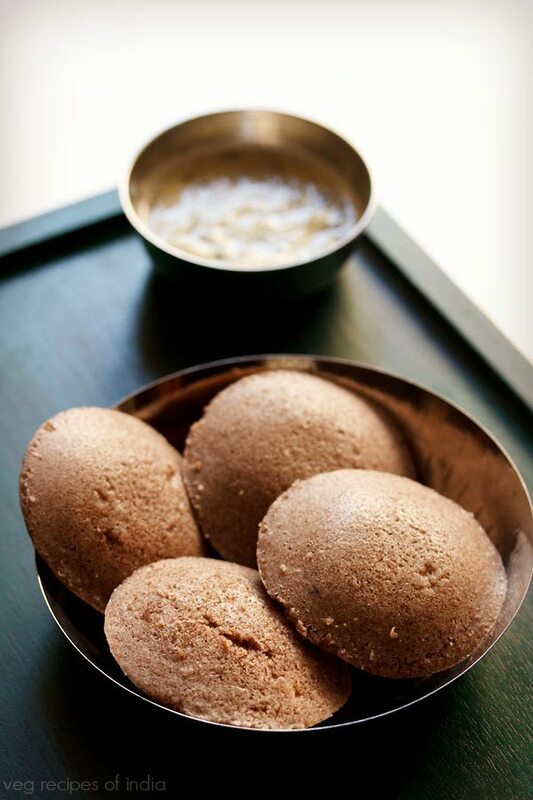 steam ragi idlis for 12 to 15 minutes. depending on the equipment you have used, it may takes less or more time. a tooth pick inserted in the center of the ragi idlis should come out clean and not be sticky. allow a standing time of 1 to 2 minutes. 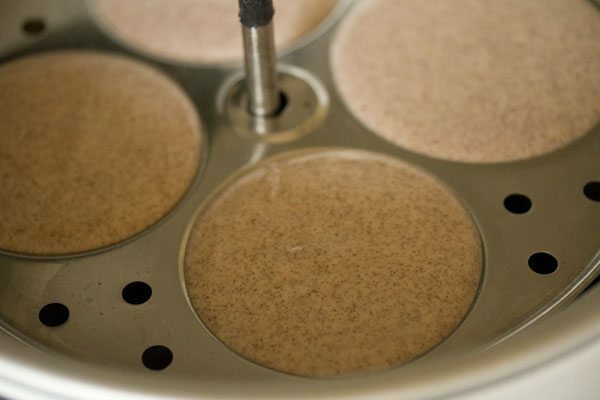 you can steam the ragi idlis in batches. the leftover batter can be refrigerated and you can make ragi dosa or ragi uttapams. 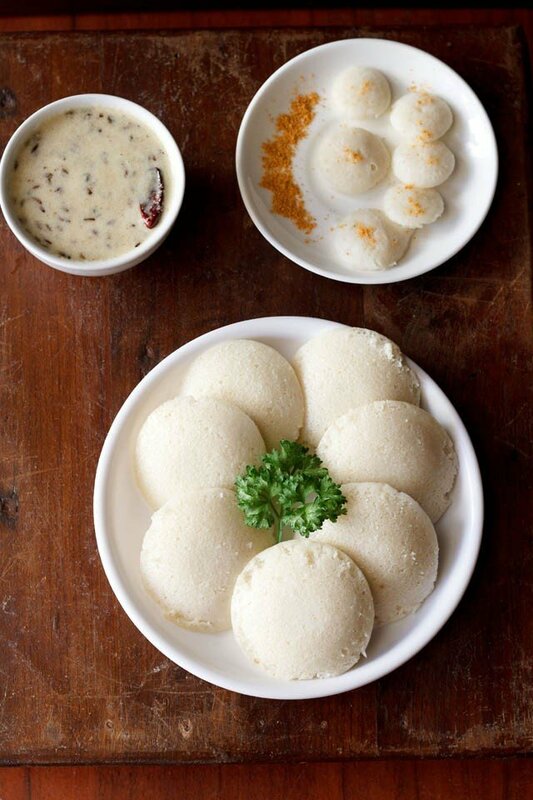 dip a spoon or butter knife in water and slid them through the idlis. remove and place the ragi idlis in a warm container like a casserole. 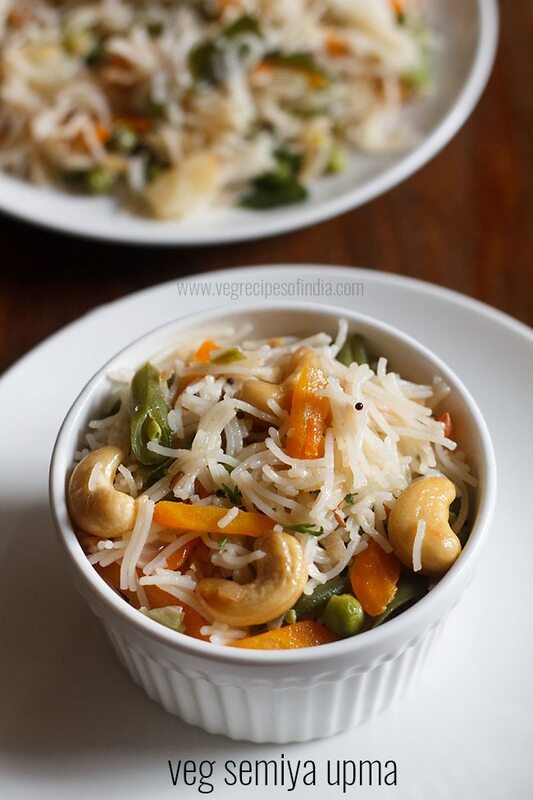 for kids you can also serve with a mix of thin coconut milk and jaggery. just dissolve the jaggery with thin coconut milk and serve with the nachni idli. for flavor you can add some cardamom powder to this solution. 1. if the batter becomes thin, you can add a few tablespoons of ragi flour. 2. if thick, then add some water. 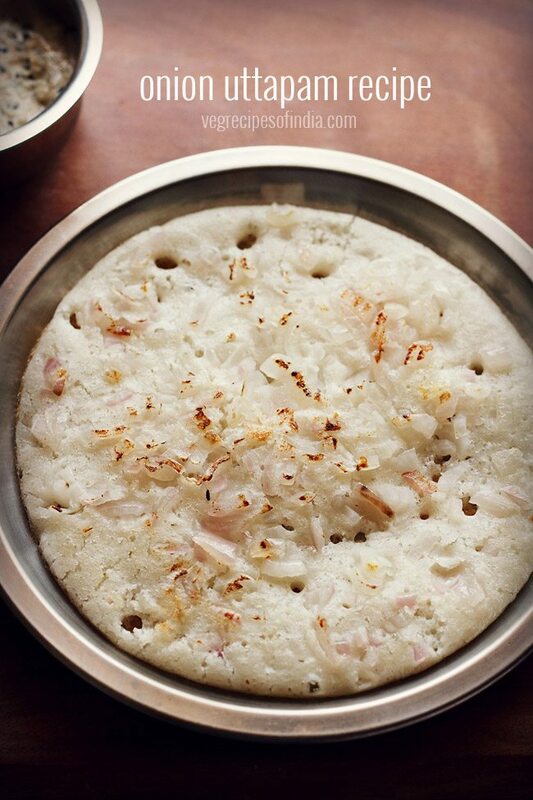 1. take 1 cup idli rice or parboiled rice (ukda chawal, sela chawal) in a bowl. 2. rinse the rice a couple of times. then add 1 to 1.5 cups water and keep aside. 3. rinse ¼ cup thick poha once or twice and add to the rice. mix well. cover and keep aside for 4 to 5 hours. 4. in another bowl take ½ cup urad dal and ¼ tsp fenugreek seeds. 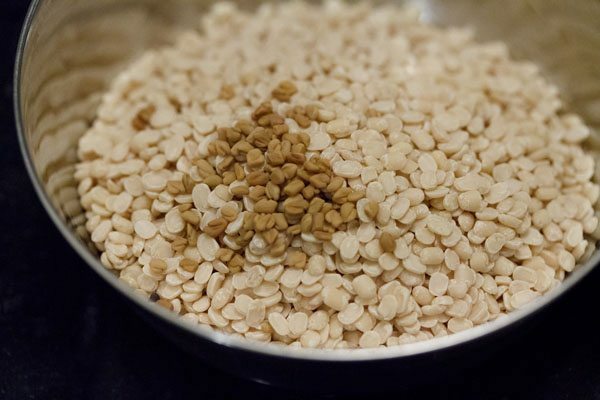 5. rinse for a couple of times and soak both the urad dal with the fenugreek seeds in 1 cup water for 4 to 5 hours. 6. after 4 to 5 hours, drain the urad dal and add in a grinder jar. also add water in parts. initially i added ¼ cup water and ground for some seconds. then i added again ¼ cup water and continued to grind. 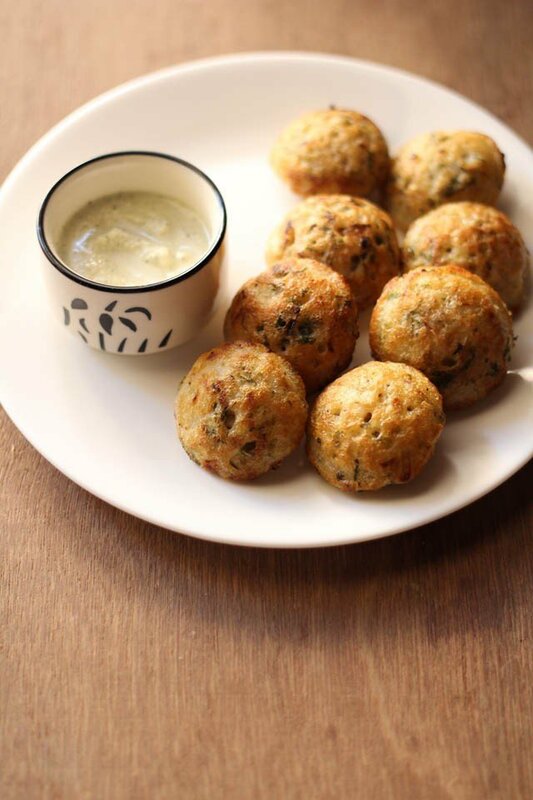 7. grind the urad dal and methi seeds till you get a smooth and fluffy batter. add water in parts while grinding. i used overall ½ cup water for grinding the urad dal. remove the batter in a bowl or pan. 8. next drain the rice & poha and add them to the same grinder jar. depending on your jar capacity, you can grind the rice in two to three batches. for the first round i used ½ cup water and for the next round i added ¼ cup water. so overall i used ¾ cup water for grinding rice. 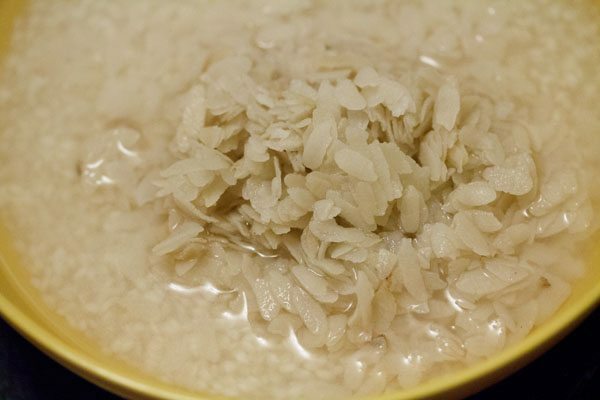 9. grind the rice till smooth or a fine granular consistency in the batter is also fine. 10. pour the rice batter in the same bowl having the urad dal batter. 11. mix both the batters very well. 12. now add 1 cup ragi flour (nachni or finger millet flour). 13. add ½ cup water. you can adjust the water amount here depending on the consistency of the batter. 14. mix very well with a spoon or with your hands. break the lumps if any. mix to a smooth batter. a bit of handwork is required while mixing the ragi flour with the idli batter. sharing a great tip from reader priya – alternatively, you could mix the ragi flour in ½ cup water (preferably warm) in a separate bowl. then add this ragi batter to idli batter. 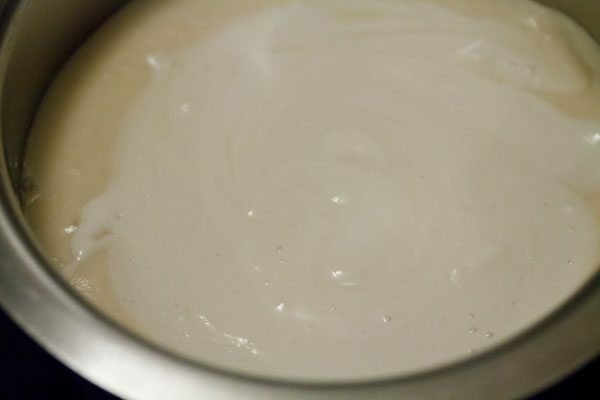 there would be no lump formation this way and also less strain while mixing. 15. cover the bowl or pan with a lid and let it ferment overnight or for 8 to 9 hours or more depending on the temperature conditions in your city. 16. the ragi idli batter next day. 17. next day add salt and mix very well. i added salt the next day due to it being a cold season here. in a warmer climate, add salt before you keep the batter for fermentation. 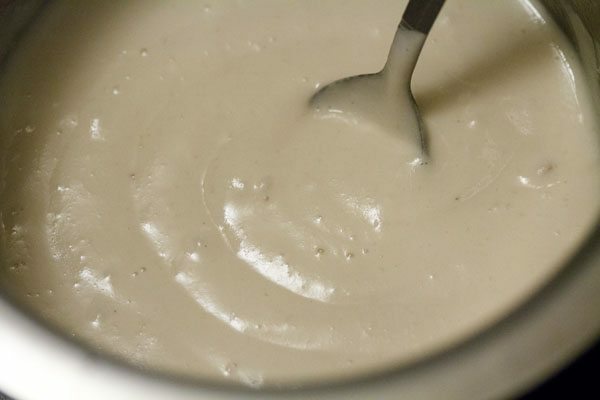 if the batter does not increase in volume, then just add ¼ tsp baking soda in the batter. mix very well and then proceed to steaming the ragi idlis. 18. grease the idli moulds with oil. pour the batter in the idli moulds. 19. before placing the idli stand, add 2 to 2.5 cups water in an electric cooker or steamer or pressure cooker. bring this water to a boil. then place the idli stand in the hot water. for an electric cooker and steamer cover with its lid and steam. for pressure cooker, remove the vent weight/whistle from the cooker and secure the lid tightly on the cooker. 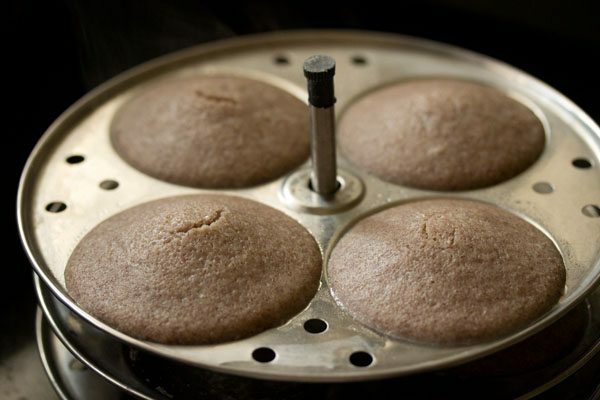 20. steam ragi idli for 12 to 15 minutes. depending on the equipment you have used, it may takes less or more time. a tooth pick inserted in the center of the ragi idlis should come out clean and not be sticky. allow a standing time of 1 to 2 minutes. you can steam the idlis in batches. 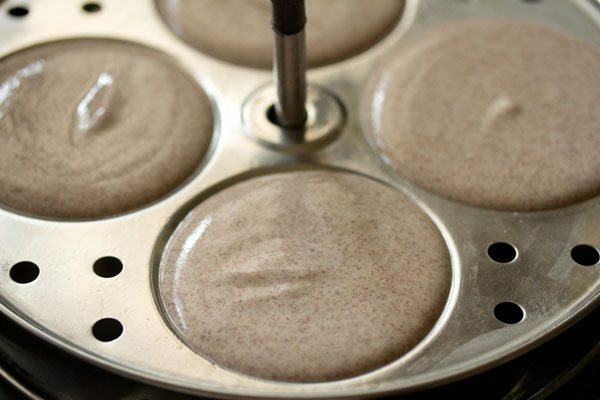 the leftover batter can be refrigerated and you can make ragi dosa or ragi uttapams. 21. dip a spoon or butter knife in water and slid them through the idlis. remove and place the ragi idlis in a warm container like a casserole. 22. serve ragi idli with coconut chutney and sambar. H..I tried this ragi idli recipe, i must tell you it was perfect, soft and fluffy. Hi, I’m not Indian so not familiar with idlis. 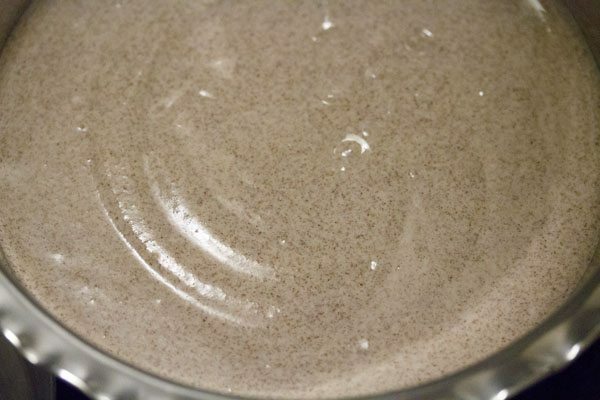 Can this batter or mixture be used to make pancakes as well? yes you can use this batter. in fact we make dosa with idli batter. 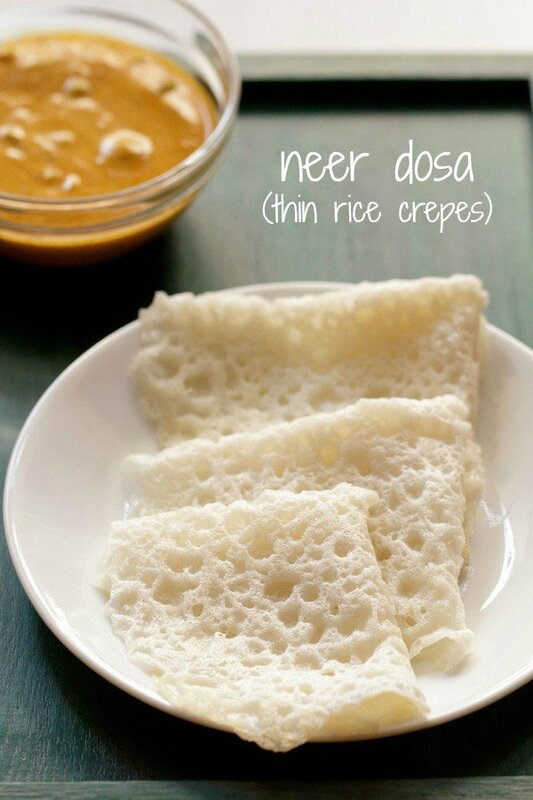 dosa is not exactly a pancake but more like a crepe. but you can use the ragi idli batter to make pancakes. Can I substitute idli rice with raw brown rice and thick poha with brown poha? yes nirupama, you can use brown rice and brown poha. Thank you so much for this recipe.I tried it,n it came out super soft n fluffy Ragi idli.Yummy n healthy too. Welcome Lakshmi. Glad to know that you liked the ragi idli recipe. Hi I already have fermented idly batter. 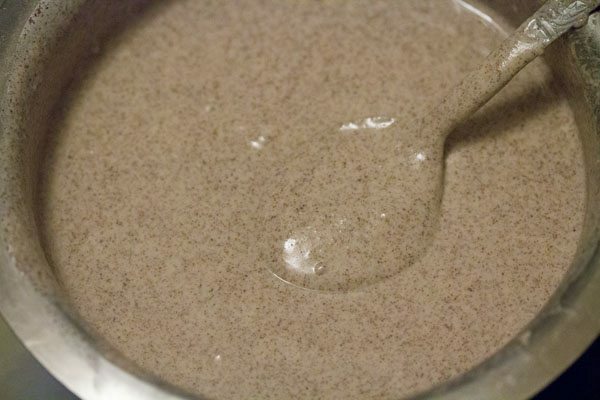 How much of it should I use to mix with the ragi flour and water mixture? Thanks. you can add 1 cup ragi flour to 2 cups of idli batter. 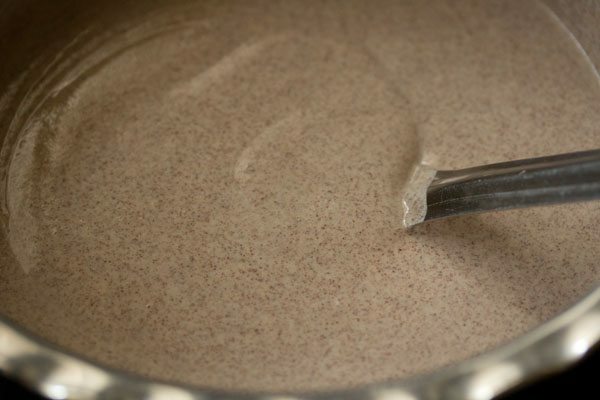 adding ragi directly will make the batter very thick & lumpy and you won’t be able to mix well. so i suggest to mix ragi in some water and then add this ragi solution to the idli batter. the mixing will be easier. thanks a lot marisa. nice to know. enjoy cooking. Hi dear .. I tried your ragi idli recipe.. It came out really well. I added Lil jaggery to it.Thank you for the recipe. welcome vijeta, glad you liked the ragi idli recipe. thanks for positive feedback. you can add jaggery. but add after the batter is fermented, just before steaming idlis. keep the batter slightly on the thicker side as after adding jaggery, the batter becomes a bit thin. Can I use matta (slight red tinge) poha instead of the polished ones? ansira, you can use red poha. I have a question, I have ragi seeds instead of flour. 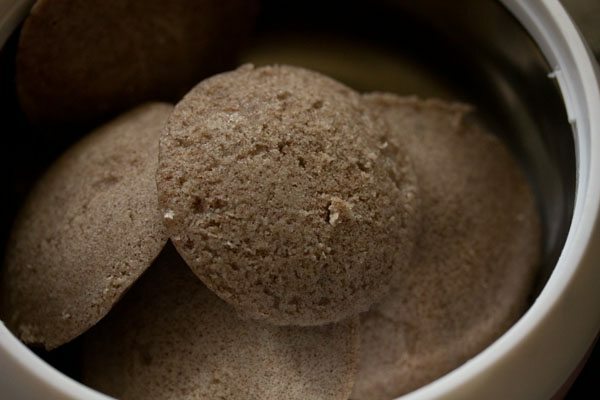 So how to use ragi seed in ragi idli batter? you will need to soak the ragi seeds in water for at least 5 to 6 hours. use about 1/4 to 1/3 cup of ragi seeds. then grind them with enough water till they are smooth. later grind the urad dal and rice. mix all the three batters well and allow to ferment overnight. nice recipe. I have one doubt like we need to prepare ragi idlis in short period of time. idli batter is ready. Now i mix ragi flour in luke warm water and then add to idli batter and let it set for couple of hours. So can i used the batter after couple of hours? animesh, when you mention idli batter is ready, it means idli batter is fermented or freshly ground? 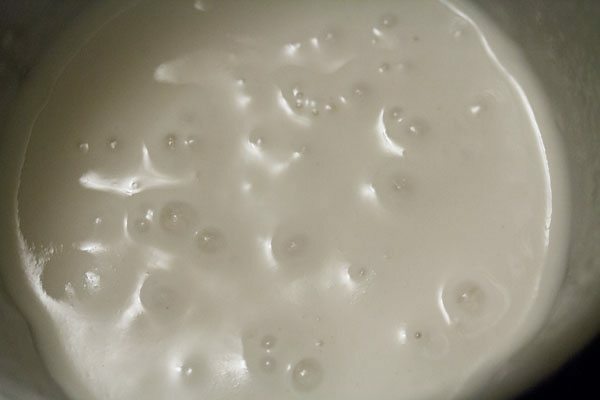 if the batter is already fermeneted, then just mix the ragi+warm water solution in the batter and keep only for 30 minutes. then you can start making the idlis. if not, then add the ragi solution and atleast keep the batter to ferment for 6 to 7 hours. 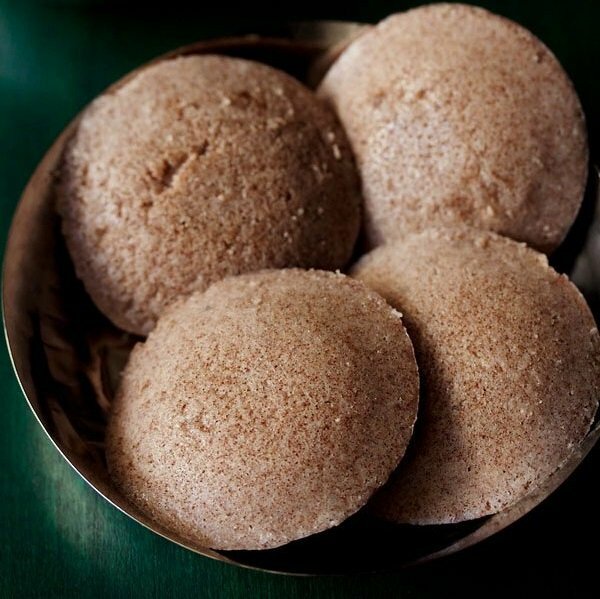 I just add ragi flour in the idli batter just an hour before preparoing idlis and it really comes out very soft ,colorful n tasty too…..
thanks priya for this great tip. i will update in the post too. Hi,the ragi idli looks very healthy! I have a small clarification. I already have fermented idli batter and ragi flour separately. Can I mix both these and make idlis? niharikka you could mix both but the batter may become thick so add little water and little cooking soda for fluffy batter. hope this help’s you.